This is a sermon about dead baby boys. Maybe not what you wanted here on the first Sunday after Christmas. In the Episcopal Church it’s John chapter 1: in the beginning was the word and the word was with god and the word was god. Cosmic and poetical and beautiful. And we have Herod killing baby boys. A story that, scholars tell us, probably didn’t happen. Goodness, so why read it? Why believe this stuff in the first place—that’s likely what some of my new friends on campus would say. The Edge House has recently embarked on a relationship with the Secular Student Alliance—atheists, agnostics, doubters, they call themselves many things. But not Christian, not believers. “What difference does this stuff make?” is a question they’re offering as a prompt for an upcoming conversation. What difference does this stuff make? Particularly when it’s about dead babies? I want to offer one possible answer, and it’s a bit unorthodox. I want to read you a book. 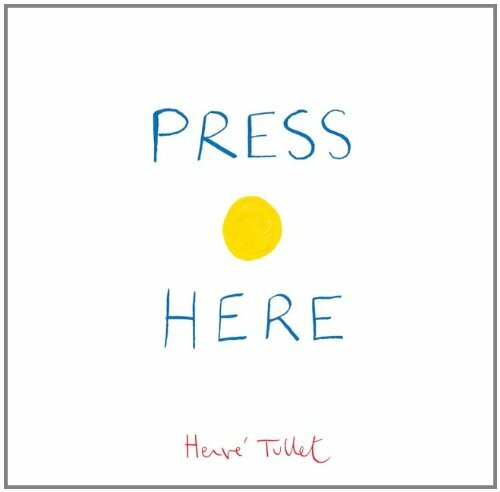 It’s called Press Here and it’s one of my 5-year-old daughter’s favorites. I want you to imagine we’re all snuggled up in the bed—yes, all of us—and we’re all in our jim-jams and we’re settled in to hear a story before bed. The book will be up on the screen, but just pretend it’s right in front of you. Feel free to follow the directions. I’m fairly certain that my adult friends don’t really think they caused those changes. The illustrator painted those static images years ago, it doesn’t change on a second reading. Come on. This is a wonderful example of what theologian Marcus Borg describes as the pre-critical, critical, and post-critical stages of faith development. Pre-critical is basically us as kids: Stories about Cinderella and Jesus and Batman and the President of the United States are all equally truthful. Batman is an eccentric billionaire who became a superhero to avenge his parents’ death—totally! And Jesus was born under a moving star and magicians from the far East came to worship him--absolutely. They’re both truthful and factual. And yes, there is a difference—facts generally show us truth, but things that are true, deeply true that you feel in your gut, sometimes aren’t factual. Think of you’re most favorite movie or novel that changed how you see things in the world—true, maybe not factual. Anyway, there’s nothing wrong with this stage except when we get stuck in it—things we understand as meaningful have to be literally, historically factual and we go to great lengths to make them so. Consider the seasonally-appropriate film Polar Express and its take on belief. The critical stage is all about understanding the stories we tell intellectually. How much of them are historically-accurate? Why did people tell them? Were any of them codes for freedom like African-American spirituals in the pre-Civil War South? Spoiler: yes, the books of Daniel and Revelation. Which stories were several stories stitched together to make one like the story of the great Flood in Genesis? What is the history of how we got the Hebrew Scriptures and how were they edited over the centuries? In scholarly circles this might be called the Historical-Critical Method and its main point is to understand on a deeper level the Word passed down to us through the centuries using historical resources outside of the Bible itself. They ask questions about how different Hebrew or Greek words were used elsewhere or what events were happening around the Jews that made them write different things. It’s good, helpful stuff and pretty much all mainline denominations teach it in our seminaries. But we can get stuck here as well. Some theologians like John Shelby Spong go to great lengths to disprove miracles and the more epic stories of the Bible, encouraging believers to see the meaning behind the myths. But Spong and others lose the poetry of scripture—it’s not just a list of dates and names but people’s lives and their attempts to make sense of seeing God in action. If you “disprove” that stuff, you lose much of the point. And many folks get so stuck in this critical stage that God ceases to be real at all for them. If these events were recorded and some invented by humans, where is the divine? It’s the reason so some Christians push so hard against non-literal reading of scripture—folks think that if any part of the Bible is not factual, it must not be true. And therefore all of it is suspect. Again, not a good place to be stuck. Luckily, Marcus Borg offers a third stage which many of us dip in and out of when it comes to our faith. The post-critical stage takes both the wide-eyed belief in the stories as told and the scholarly, perhaps cynical understanding and holds them next to one another at the same time. The story in Matthew about Jesus and his folks fleeing to Egypt is a literary device to remind readers of both the Exodus led by Moses and the later Exile when thousands were killed and displaced by invading Babylon. There is no historical evidence and no other mention in the Bible that Herod had any children killed, because of Jesus or not. But Matthew recalls the prophet Jeremiah speaking of Rachel weeping over her children Israel. Matthew is making past grief new again to make Jesus’ miraculous birth and miraculous life even more miraculous. AND this story about a family becoming refugees to avoid terrible death at the hands of a despotic leader is deeply true. We have only to consider Syria and the 2,000,000 people, 1,000,000 of them children, who have fled the war there. Or mothers escaping abusive relationships with their children. Or students fleeing a school-shooter. Post-critical reading of scripture doesn’t take away from the beauty and authority of the Word, it adds to it, deepens it. Like nostalgia or parenthood adding flavor to the reading of Press Here, even more do history, literary criticism, and our own life-experiences add to the reading of scripture. BUT ALSO in the midst of this horrific account of the slaughter of baby boys, Matthew recalls for us Jeremiah’s words, not only of Rachel’s weeping for her children, but what follows: “Return, O virgin Israel, return to these your cities. How long will you waver, O faithless daughter? For the Lord has created a new thing on the earth: a woman encircles a man. how could we not draw parallels to school shootings or mass graves in Sudan and WWII Germany? And we’re meant to. Herod’s evil, Babylon’s evil, Pharoah’s evil are not unique nor is our mourning. We cry for our own children—we cry when we lose them, we cry when they’re happy because the world isn’t good enough for them, we cry because the same story seems to keep happening. And then Jesus comes and, to the critical eye, the story is the same and it doesn’t make any difference. And to the post-critical eye, Jesus comes and there’s something else going on. It’s the same story, but the themes are different, it’s meaning is different, how we react to it is different. It’s the same story, “A decree went out from Caesar Augustus that all the world should be taxed…” and the no room at the inn, and the shepherds, and the flight to Egypt to avoid the slaughter of the innocents. we see hope. We see that God is doing a new thing. God is writing a new book and taking our crappy lives and memories and actions and making something else, something unexpected with them. There are people out there fighting against the world’s brokenness and hurtfulness. People inspired by Jesus and people who’ve never heard of him. People who will not just accept Herod and Babylon and Pharoah. May we be those people. May we see the hurt, may we stop and ask if we can help. May we offer love in the place of judgment and embrace in the place of fear.